Are you preparing to take the Neonatal and Pediatric Final Exam in Respiratory Therapy school? If so, good, because this is the article for you. That’s because, below, you can get access to our study guide that lists out a variety of practice questions covering a wide range of topics all about Neonatal and Pediatric Care in Respiratory Therapy. Now, of course, each and every Respiratory Therapy program is different, but still, this study guide will serve as a fantastic review for everything you learned throughout the semester concerning Neonatal and Pediatric care. So if you’re ready, let’s go ahead and dive right in! 1. Which of the following statements describe truncus arteriosus? A. The pulmonary artery arises from the left ventricle, and the aorta stems from the right ventricle. B. If PVR increases relative to systemic vascular resistance (SVR), more blood flows to the lungs through the truncus, decreasing systemic cardiac output. C. If SVR decreases relative to PVR, blood flow will be shunted from right to left, bypassing the lungs. D. A large VSD allows total mixing of blood from the two ventricles. 2. What factor is responsible for the closure of the foramen ovale? 3. What is the incidence of respiratory distress syndrome (RDS) among infants born at less than 28 weeks of gestation? 4. What radiographic features is the therapist likely to see on a typical chest X-ray of an infant with MAS? 5. The therapist is treating a child with TOF who appears to be having a “tet” spell. What should the therapist suggest to treat this event? 6. The therapist is setting pulse oximetry to determine the presence of right-to-left shunt in an infant suspected of having a heart defect. Where should the therapist place the pulse ox probe to obtain the most accurate measure of preductal oxygen saturation? 7. Which of the following physiologic mechanisms need to be in place to ensure adequate systemic perfusion in infants with hypoplastic left heart syndrome (HLHS)? 8. Blood samples are simultaneously obtained from both the right radial artery and the umbilical artery, and the arterial partial pressure of oxygen (PaO2) value from the right radial artery is 20 mm Hg greater than that analyzed from the umbilical artery sample. On the basis of this finding, which of the following conditions does the neonate likely have? 9. What ventilator settings should a therapist select for a newborn with respiratory distress syndrome? 10. Why does meconium staining occur predominantly in infants older than 36 weeks of gestational age? 11. Which of the following clinical manifestations is consistent with an atrial septal defect (ASD)? A. An ASD often causes congestive heart failure (because of decreased pulmonary blood flow). B. The right ventricle may become hypertrophic (right ventricular hypertrophy). C. Most patients with an ASD are symptomatic in the neonatal intensive care unit, presenting with right atrial enlargement. D. Chest radiographs are usually abnormal. 12. What is the typical type of airway obstruction that occurs with MAS? 13. How should the therapist interpret a preductal-to-postductal PaO2 difference of 8 mm Hg in a neonate? 14. Which of the following congenital cardiac anomalies is classified as conotruncal, associated with a “boot-shaped” appearance of the heart? 15. Which of the following medications should the therapist recommend for an infant with apnea of prematurity experiencing episodes of apnea? 16. Which of the following therapeutic interventions is generally needed to treat transient tachypnea of the newborn (TTN)? 17. Which of the following blood gas parameters should the therapist target when managing patients with PPHN? 18. Eight hours after being born, a baby presents with cyanosis despite administration of adequate ventilation, tachypnea, and retractions. Which of the following conditions should the therapist suspect is affecting this newborn? 19. Which of the following clinical features characterize a critical aortic stenosis in a neonate? A. Chest radiography reveals pleural effusion and pulmonary engorgement. B. The neonate often has metabolic alkalosis. C. The neonate presents in cardiogenic shock with hypotension. D. These infants are rarely symptomatic during the first month of life. 20. When using subambient oxygen therapy, what range of oxygen saturations should the therapist target? 21. At birth, what factor causes dilation of the pulmonary vascular bed and a decrease in the pulmonary vascular resistance? Which of the following conditions does this patient likely have? 23. While reviewing the chest X-ray of a newborn, the therapist observes the following features: continuous diaphragm sign and linear bands of air paralleling the left side of the heart and the descending aorta with extension superiorly along the great vessels into the neck. Which of the following conditions does this patient likely have? 24. How should the therapist interpret a lecithin-to-sphingomyelin (L:S) ratio of 2:1? 25. The therapist is treating a child with a congenital heart defect who is unresponsive to oxygen therapy. Although the chest X-ray is relatively normal, the heart is described as “egg-shaped.” Which of the following heart defects is more consistent with this description? 26. Which of the following strategies can be used to increase pulmonary vascular resistance (PVR) in infants with hypoplastic left heart syndrome (HLHS)? 27. Which of the following methods is involved in the management of a PDA? 28. For which of the following congenital cardiac defects may spontaneous closure of the ductus arteriosus be catastrophic? 29. The therapist is reviewing the chest radiograph of a newborn, preterm infant and observes diffuse, fine, reticulogranular densities, which provide a ground-glass appearance. On the basis of these radiographic findings, which of the following conditions should the therapist suspect is present? 30. In addition to Group B Streptococcus, which of the following microorganisms are responsible for nosocomial pneumonia acquired after delivery? 31. Which of the following risk factors contribute to the pathogenesis of BPD? 32. What is the significance of an infant with RDS demonstrating a grunt during each exhalation? 33. The therapist is assessing a newborn on the mechanical ventilator. The neonate shows clear signs of respiratory distress, and lung auscultation reveals shifting of the PMI towards the left and breath sounds decreased on the right. What should the therapist suspect this newborn developed? 34. When neonatal pneumonia is suspected, how long does an infant generally receive broad-spectrum antibiotics? 36. Which of the following medications is the most common preoperative treatment to minimize preductal constriction until surgical correction of coarctation of the aorta can be achieved? 37. When should a therapist consider intubation and mechanical ventilation for a newborn with respiratory distress? 38. When should a therapist consider CPAP for a newborn with respiratory distress? 39. A therapist monitoring an infant after a Blalock-Tausig shunt placement notices a significant drop in the end-tidal carbon dioxide (ETCO2) despite no changes in the infant’s respiratory rate. How should the therapist interpret this change? A. The infant has dramatically improved ventilation by breathing deeply. B. The ETCO2 monitor is not accurate. 40. Which of the following blood flow patterns occurs in complete transposition of the great arteries? A. The systemic venous blood passes through the right heart chambers. B. The pulmonary venous blood traverses the left side of the heart and then returns to the systemic circulation. C. When PVR increases relative to SVR, blood flow increases through the ductus arteriosus. D. Systemic venous blood flows to the lungs after leaving the right ventricle. 41. Which of the following clinical pathophysiologic manifestations are consistent with a large ventricular septal defect (VSD)? A. The majority of the blood flow is shunted from left right to right left. B. Shunting typically occurs during ventricular diastole, which causes left atrial enlargement. C. Chest radiography reveals an enlarged cardiac silhouette and increased pulmonary vascular markings, increasing pulmonary blood flow. D. Thickening and fibrosing of the pulmonary veins develop, decreasing pulmonary artery pressure. 42. A newborn suspected of having a pneumothorax is rapidly deteriorating. What should the therapist suggest at this time? 43. What should the therapist select as target gas exchange parameters after surgical intervention for infants with hypoplastic left ventricular syndrome HLHS? 44. How should the therapist interpret the lack of foam appearing during the shake test? 45. Which of the following vessels return blood to the right atrium? 46. Which of the following conditions increase the risk of developing RDS? 48. Why must supplemental oxygen be judiciously administered to patients with an atrioventricular canal defect? 49. The therapist is contemplating the possibility of intubating and suctioning a nonvigorous newborn with MAS. Which of the following clinical parameters confirms the indication for the procedure? 50. A neonate diagnosed with a pneumothorax was treated with a chest tube. After 36 hours, the therapist noticed that bubbling is present in the chest tube system. What should the therapist do at this time? 51. A therapist is monitoring a child on the mechanical ventilator who is hemodynamically stable. The PetCO2 is 48 mm Hg. If accurate, what should be the PaCO2? 52. What is volumetric capnography able to determine? 53. The respiratory therapist has initiated iNO at 20 ppm for an infant with pulmonary hypertension. After 2 hours a blood gas test reveals a 10% improvement in SaO2. What should the therapist do? A. Keep iNO at 20 ppm and wait at least 2 hours before considering any change. B. Increase iNO to 30 ppm and keep the same FiO2. C. Keep iNO at 20 ppm and wean the FiO2 by 10%. D. Increase iNO to 30 ppm with no changes in FiO2. 54. Vascular smooth muscle is largely dependent on which of the following intracellular ions? 55. Which of the following medications contributes to an increased right-to-left intrapulmonary shunting? 56. The therapist is performing a routine assessment and ventilator check on a patient who is receiving heliox near the wye adapter of the ventilator circuit. He notices a serious discrepancy between the set tidal and the exhaled volume. What should the therapist do to correct this situation? 57. The therapist taking care of an infant on iNO observes that the NO2 levels have been increasing. In order to correct the situation, he increases the inspiratory flow of the ventilator. What will be some of the limitations associated with this change? I. It reduces time of contact between NO and O2. II. It affects the mean airway pressure because it changes the inspiratory time. III. It may increase the delivered tidal volume. IV. It reduces the mean airway pressure and increases the inspiratory time. 58. Which of the following features or characteristics apply to mainstream capnography? I. The mainstream capnograph contains narrow tubing that can become occluded with mucus. II. Mainstream capnography generally employs infrared spectrometers. III. The mainstream capnograph does not add much weight to the breathing circuit. IV. The mainstream capnograph is placed at the proximal end of the endotracheal tube. 59. During the administration of aerosol therapy, how does a heliox mixture compare with an air-oxygen mixture as a carrier gas? A. Less aerosol is deposited with heliox. B. More aerosol is deposited with heliox. C. The two gas mixtures are equally efficient. D. Definitive data are not available. 60. An infant on high-flow nasal cannula also requires administration of albuterol every 6 hours. The flow of the cannula was adjusted from 4 to 5 liters per minute. How could this affect the aerosol delivery to this infant? A. It will be unchanged. 61. Which of the following parameters of mechanical ventilation are affected negatively by the use of heliox? 62. What is the purpose of administering helium–oxygen gas mixtures to patients? 63. What is the normal gradient between PaCO2 and end-tidal CO2 (PaCO2 minus end-tidal CO2)? 64. What is the primary physiologic activity of inhaled nitric oxide? 65. What clinical parameter is critically important to monitor when mechanical ventilation is administered? 66. The therapist is treating a very irritable young child with upper airway obstruction. Which oxygen device will be the most appropriate to administer the greatest concentration of helium? 67. Why do transcutaneous oxygen tension (PO2) and carbon dioxide tension (PCO2) values differ from PaO2 and PaCO2 measurements? 68. As the therapist applies a pulse oximeter finger probe to a neonate who is receiving supplemental oxygen, she notices that the SpO2 reading is 100%. What should the therapist do in this situation? A. The therapist should continue monitoring the patient because the reading is accurate. B. The therapist should obtain an arterial blood sample to confirm PaO2 level. C. The therapist should switch to using a capnometer. D. The therapist should reduce the fraction of inspired oxygen. 69. Inhaled NO has been administered to an infant for nearly 4 hours. The respiratory therapist notices suboptimal response and suggests HFOV. What is the principle behind the potential benefit of adding this ventilatory modality to this infant? A. HFOV improves ventilation and reduces the formation of NO2. B. Lung volumes are optimized with HFOV and further enhance the effects of iNO. C. The high frequency accelerates the diffusion of NO through the alveolar surface. D. HFOV reduces the need for higher doses of iNO. 70. An infant has been receiving iNO for the last 3 days. Which important level should be monitored when ordering a co-oximetry? 71. How is the percentage of functional hemoglobin that is saturated with oxygen determined via pulse oximetry? A. The percentage of red light that lands on the photodiode represents the SpO2 (oxygen saturation as determined by pulse oximetry). B. The percentage of infrared light that reaches the photodetector reflects the SpO2. C. The ratio of the red and infrared light that reaches the photodiode signifies the SpO2. 72. Which of the following conditions will preclude the use of indirect calorimetry? 73. The therapist has applied a bandage-type pulse oximetry probe too tightly to an infant’s finger. What problem can be expected to occur in this situation? A. The SpO2 will read erroneously low. B. The SpO2 will read erroneously high. C. The monitor will display a message indicating inadequate pulse. D. The monitor will display fluctuating SpO2 values between being erroneously low and high. 74. Which of the following is the main physiologic factor responsible for deriving accurate transcutaneous data? 75. Which of the following substances prevents the release of Ca2+ from the sarcoplasmic reticulum? 76. Which of the following inhaled anesthetic gases has/have demonstrated the possibility to treat status asthmaticus? 77. What is the potential benefit of adding heliox to patients who have status asthmaticus while undergoing mechanical ventilation? 78. While attending to a neonatal patient in the neonatal intensive care unit (NICU), the therapist notices that a transcutaneous electrode is affixed to the upper chest of the neonate. What should the therapist do at this time? A. The therapist should only continue monitoring the patient since the transcutaneous electrode is properly placed. B. The therapist should reposition the electrode on the neonate’s abdomen. C. The therapist needs to move the transcutaneous electrode to the infant’s right shoulder. D. The therapist should relocate the electrode on the sternum as close as possible to the heart. 79. The therapist is evaluating a small tachypneic infant receiving heliox mixture 70:30 through an infant hood. Although the SpO2 has improved, the child shows signs of worsening work of breathing. What is the most probable mechanism to explain this situation? A. The FiHe is too low in a 70:30 mixture to change work of breathing in this infant. B. The flow going through the infant hood is inadequate. C. A greater concentration of helium is present at the top of the hood and away from the infant’s nose and mouth. D. The infant is breathing too fast; thus heliox is not reaching the airways. 80. Although very small amounts of NO2 are present at the bedside, which health care workers need to exert special precautions to minimize exposure to NO2? 81. What is the purpose of indirect calorimetry? 82. A patient who has been admitted with status asthmaticus is receiving beta adrenergics every 2 hours and heliox with very limited response. What should the therapist suggest at this time? 83. Which of the following inhaled anesthetics should the therapist recommend to administer via a face mask to a conscious, spontaneously breathing pediatric patient who has status asthmaticus? 84. What is the product of the reaction between oxygen and nitric oxide? D. The two molecules do not react with each other. 85. The therapist is using an oxygen flowmeter to deliver an 80:20 heliox mixture to a patient. The reading on the flowmeter is 10 L/minute. What is the actual flow received by the patient? 86. The therapist has been asked to measure preductal oxygen saturation. Where could the therapist place the pulse oximeter probe? 87. After increasing the inspiratory flow of the ventilator to decrease the generation of NO2 the therapist notices many changes in the ventilator parameters. The therapist adds the NO into the inspiratory limb of the ventilator circuit close to the patient. What will be a limitation of the procedure? A. A larger number of oxygen radicals are produced at this position. B. Adding NO too close to the patient reduces proper mixing, which is necessary to ensure accurate NO measurement. C. Adding NO in this position of the circuit is contraindicated. D. The contact time between NO and O2 is too long to be clinically useful. 88. The respiratory therapist has initiated nitric oxide for an infant with severe refractory hypoxemia. The initial dose was 20 ppm and titrated up to 30 ppm for the last 4 hours due to lack of response. However, there still is no response. What should the therapist do? 89. The therapist is assessing a mechanically ventilated infant and observes that the transcutaneous electrode temperature is set between 41° C and 44° C. What action does the therapist need to take at this time? A. The temperature range set is appropriate; therefore, no action is necessary. B. The therapist should increase the temperature range to 47° C to 48° C.
C. The temperature of the transcutaneous electrode needs to be reduced to 36° C to 38° C.
D. The electrode needs to be repositioned and maintained at the same temperature. So there you have it. 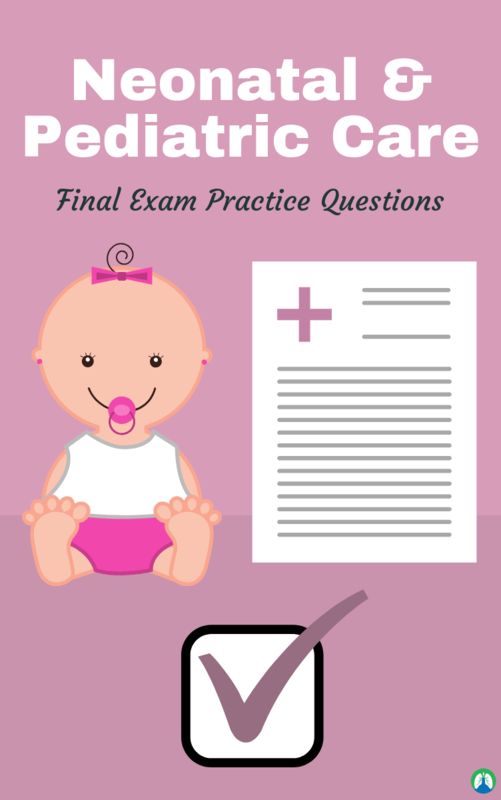 I hope that this study guide was helpful for you and can serve as a great review for your Neonatal and Pediatric Final Exam. As I mentioned before, I realize that each Respiratory Therapy program is different, so I may not have included a question about every single topic that you’ll see on your final exam. Still, if you go through this information, I have no doubt that you can boost your knowledge and improve your score when it’s all said and done. Thank you for reading and I wish you the best of luck. And if you need the answers to these questions, you can get access to them by Clicking Here.